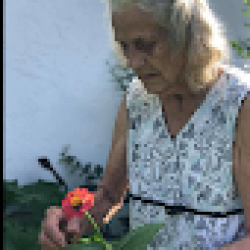 Catherine Whited, 82 of Belleview left us on Sunday, September 16, 2018 at 6:24 pm to be with her husband of 53 years Coy V Whited. (10/07/1930 – 04/13/2005). Awaiting along with Coy were her parents Marion James and Martha Jane Overstreet. Sitting beside them were her siblings; DeeAnna, Dorothy, James (Geeker), Hershel, Hattie Bell, Ruth, Helen, Nellie, Robert, and Dole. Catherine left behind a son, Larry Keith Whited (Valerie Schaefer Whited) and a daughter Erania Whited, grandchildren; Ryan Whited, David Whited, and Evan Michael. Great grandchild RayLynn Kai Whited. Adopted children; Angie Miller, Lori A. Carnes, Cody John, Jorge Santana, and numerous nieces, nephews, and friends. Catherine was the matriarch of the family. She loved her big family and flowers. Catherine enjoyed gardening and creating quilts. She will be remembered for her kind heart, determined spirit, and the love of her family. The family asks for flowers be sent to 10973 SE 45th Ave., Belleview, FL. 34420. Monitory donations can be sent to the home. A Celebration of Life Service will be held on October 13, 2018 from 4:00 -8:00 pm at the Cumberland Mountain State Park located at 24 Office Drive, Crossville, TN 38555.